The President visits Chattanooga today to continue to promote his job-creation campaign. But Amazon? Really? Why is President Obama using Amazon to tout his ideas for job creation? “Welcome to Chattanooga, one of hundreds of cities throughout this great nation struggling to succeed in spite of your foolish policies that limit job creation, stifle economic growth and suffocate the entrepreneurial spirit. That’s because your jobs creation plans so far have included a ridiculous government spending spree and punitive tax increase on job creators that were passed, as well as a minimum wage increase that, thankfully, was not. The red lines on the left — where the lines are going further down every month — were the period when President Bush was in office. In the first months of the Obama Presidency the economy was losing more than 800,000 jobs per month. Then the “ridiculous spending spree” stimulus kicks in and the lines start moving back up again. The point of that dramatic ‘V’ is the point where the stimulus kicks in. 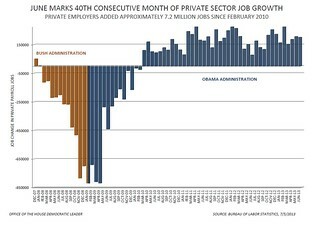 Those are the blue lines that go up until the economy is gaining jobs again. 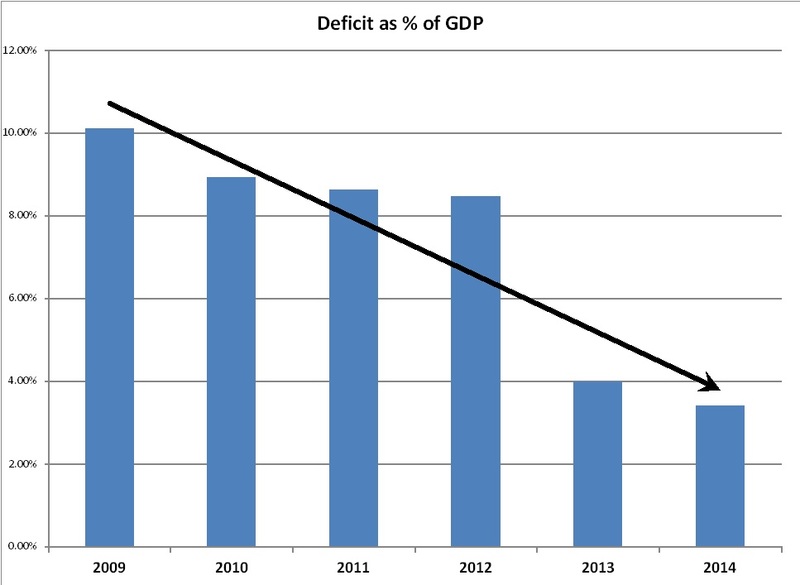 But then the stimulus winds down, the Republicans obstruct any further stimulus, and things stagnate. Also, of course, Obama’s embrace of Amazon dismays many booksellers. To coincide with the President’s visit Amazon announced a plan to hire as many as 7,000 new employees. Amazon says these new jobs will be full-time and full-benefi. The company has promised to pay 30% above traditional retail jobs and says the jobs will come with stock grants that have been boosting Amazon employee pay by an average of 9%, and the jobs include 95% tuition reimbursement for those attending college. Also the jobs represent a 25% staffing boost, which could lower the work pace for existing employees. “Q) I guess my question is for Jen. In the press release, you say it’s an opportunity for a good job that pays good wages. And then, today, of course, the President is speaking at Amazon. Are the jobs that Amazon is talking about today — 5,000 new jobs at $11 an hour, which is below the poverty level — is that the kind of jobs the President really wants to create? MR. SPERLING: We probably had more full-time job creation in this recovery than in some of the previous recoveries. And this President has a robust economic growth package, which is designed to create well-paying middle-class jobs. But we should not denigrate any job or any work. People work at different jobs throughout their lives; families piece together sometimes two incomes to have a degree of middle-class security. So we need — we have our plan. The President is focused on things like manufacturing innovation; on having a community college career — community college-to-career initiative to make sure people are getting trained to meet the high-skilled jobs that pay higher wages; the infrastructure, which is important for making the United States an attractive place to locate, All of that is designed to bring forward the strong, high-paying middle-class jobs.